This collection has been created in collaboration with Mr Erte' (famous Art Deco Master in France and USA in the 30's) who designed 7 carafes representing 7 steps of the cognac-making process : Vine, Harvest, Distillation, Ageing, Tasting, Spirit of Cognac, Angels' share. Each bottle has been produced in 12000 units (numbered). One bottle was launched every year between 1988 and 1994. 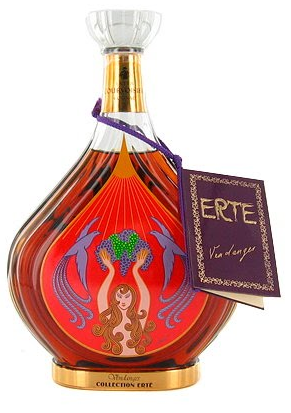 It is a Grande Champagne blend (best area in the cognac delimited region) with a cognac of 1892, date of Mr Erte's birth, with an average of 60 years of ageing.